Walbury Camp, West Berkshire, England. Walbury Camp is a large univallate Early Iron Age hillfort of around 82 acres (33 hectares), making it the largest in Berkshire. Roughly trapezoid (kite shaped) in form, the banks, though not particularly high from the inside, take advantage of a formidable scarp, with the top of the rampart on the north side towering approx. 16 ft (5 metres) over the ditch bottom. The entrances are in the north-west and south-east ramparts. A holloway runs from the north-west entrance, crossing two outworks across the neck of the hill. This entrance also has additional banks connected to its terminals, producing a ‘barbican’ like structure. Summary: On the highest part of the Downs between West Berkshire and Hampshire and to the E of Combe Gibbet, a large, trapezoidal, univallate hillfort of 33ha. 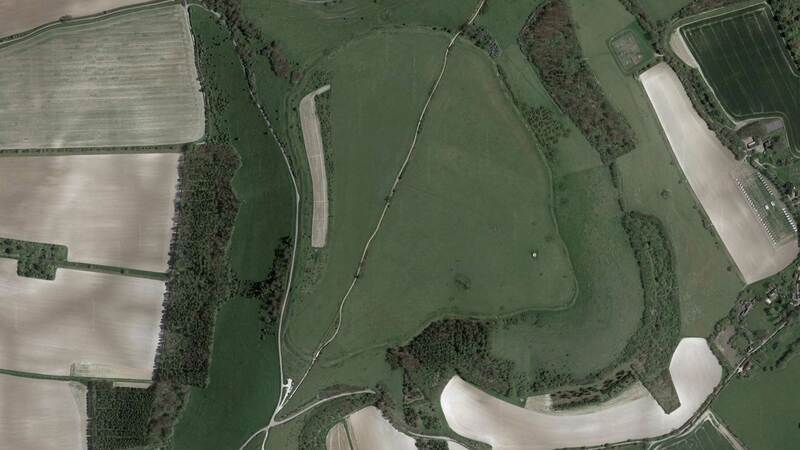 It is located at the widening of an EW chalk ridge and is the largest hillfort in the former county of Berkshire. An outer bank cuts across the spur in the NE and traces of counterscarp banks occur in places. Slight banks extend from the NW entrance as ‘barbican-like’ features (Payne 2006:45). The main entrance lies in the N-W with a further entrance in the SE which is considered to be original based on the widening of the ditches. A gap with staggered entrance in the outer bank might also be original. Beyond these In the W, a further 120m length of ditch cuts across the ridge. Both are associated with a hollow way. The presence of internal features is unknown and no excavation has taken place. A magnetometry survey produced a large number of anomalies, only a small number of which were possibly archaeological but would require excavation to confirm (Payne 2006: 47). Because of the large area enclosed, slight enclosing works and lack of evidence for intensive activity it has been classified by Cunliffe (2002: 380) as an ‘early hill-top enclosure’ with a pastoral function. The monument survives in good condition but is undated other than by morphology. The earliest known reference is in Camden’s Britannia c.1586. Recorded on Ordnance Survey drawing of Hungerford 1808.